A couple of weeks ago, shortly after Christmas, a group of us finally made the trek up to 161 to try Borgata Pizza Café for ourselves. (This coming after a failed attempt when Tania and I tried to go on a Sunday, and discovering it closed, had to settle for Nazareth Deli instead.) Our group consisted of Tania, Ron, myself, and Tania’s brother David. It’s important to note here that both Tania and Ron are what one might call “Pizza Fiends.” That of course is a term of art, designating pizza who would probably eat pizza all day every day if they could. The fact that they also concur in the conclusion that Borgata Pizza Café is awesome should therefore mean something to you. For being located in a strip behind a Dunkin Donuts, Borgata actually has a rather pleasant ambiance. There are tables along one wall, and there’s a counter space, with nice stone countertop. 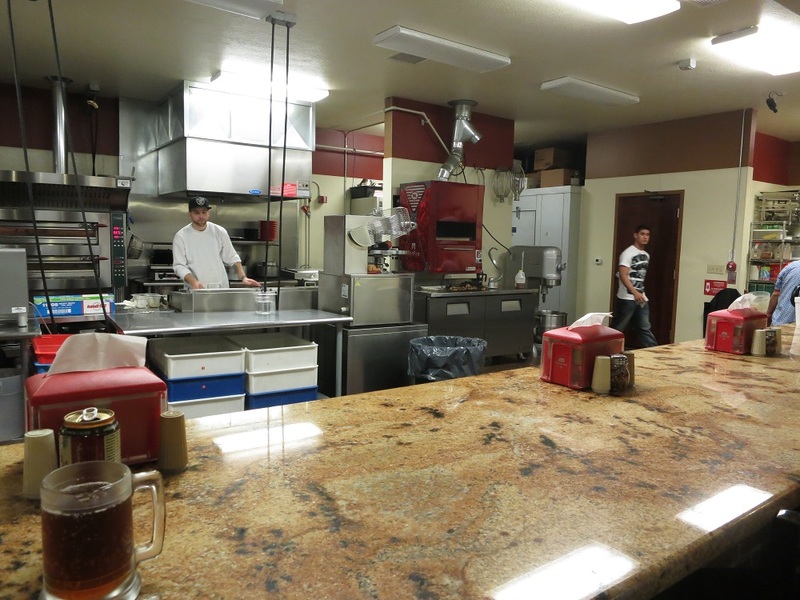 Sitting at the counter is especially great because of the other, predominant, feature of the restaurant: the large open kitchen. The open kitchen really makes the space feel very open and welcoming. Plus, when you sit at the counter, you get to spend your time watching them make pizzas—there’s even some dough throwing that takes place from time to time. A view into the kitchen at Borgata. The open kitchen really makes the space feel open and welcoming. The open kitchen also contributes to Borgata in other ways as well. One being that it allows for great customer service. While sitting at the counter on a recent visit, I think that we were asked at least once by everyone working there how we were doing, if we needed anything else. Far from being overbearing, the attention we received just reflected a sincere desire on the part of everyone working there to ensure that we enjoyed their pizza as much as possible. You might have been wondering when I’d finally get around to talking about the pizza. Well, the answer is now. The pizza is a traditional one, in the sense that it’s cut into slices, not squares as is common so many other places around town. The crust is quite thin, and without folding is likely to droop at the point. If you’ve acquired pizza-folding skills as the result of a life time of eating NY-style pizza, this would be a place to put those skills to use. The edge of the crust is in the exact right proportion to the toppings. Unlike so many other slices of pizza, it’s not too thick and bready. It’s also delicious in its own right. There is a subtle sweetness to the crust that helps this pie transcend other pizzas. 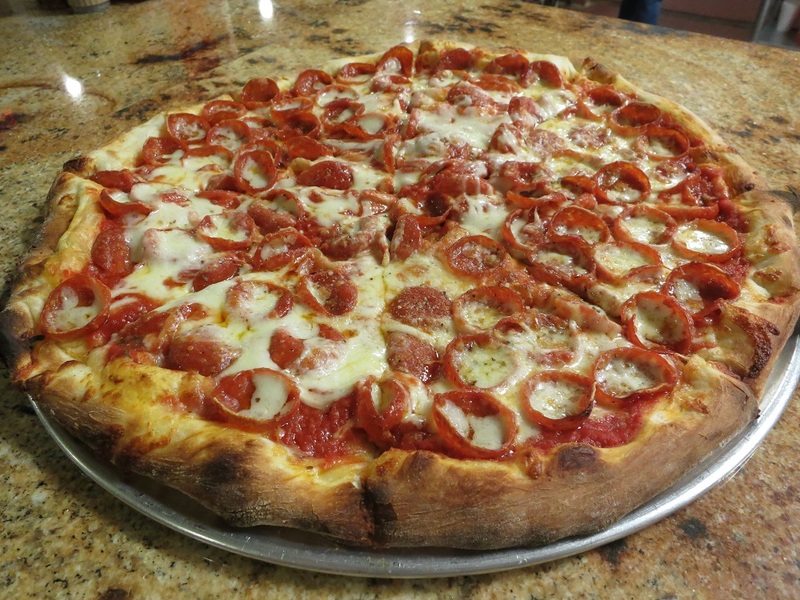 The delicious flavor of the crust almost makes you look forward to finishing a slice. Almost. And that’s because the rest of the pizza is as good as the crust. The sauce is well-seasoned and slightly sweet. It tastes of tomatoes, with a just the right amount of spices. It’s well balanced, standing out just enough to remind you it’s there, but blending in enough so that it doesn’t dominate on its own. The pepperonis are ready for their closeup now. 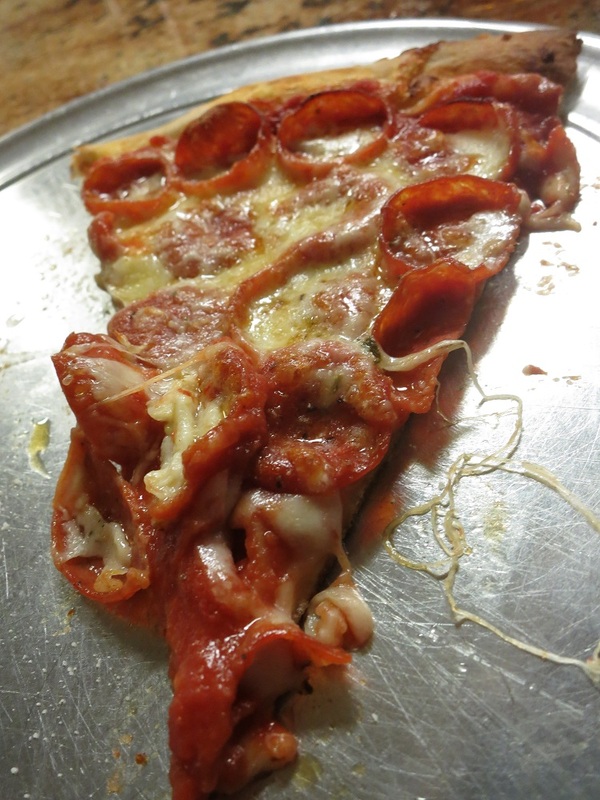 So far I’ve only had the pepperoni, that staple of American pizza toppings. And it’s really good quality pepperoni. It’s cut small, so it curls up when baked—my favorite style. I’m having a hard time putting my finger on what makes these small pepperonis better than others of the same size/shape that I’ve had. The best description is that they taste more meaty. 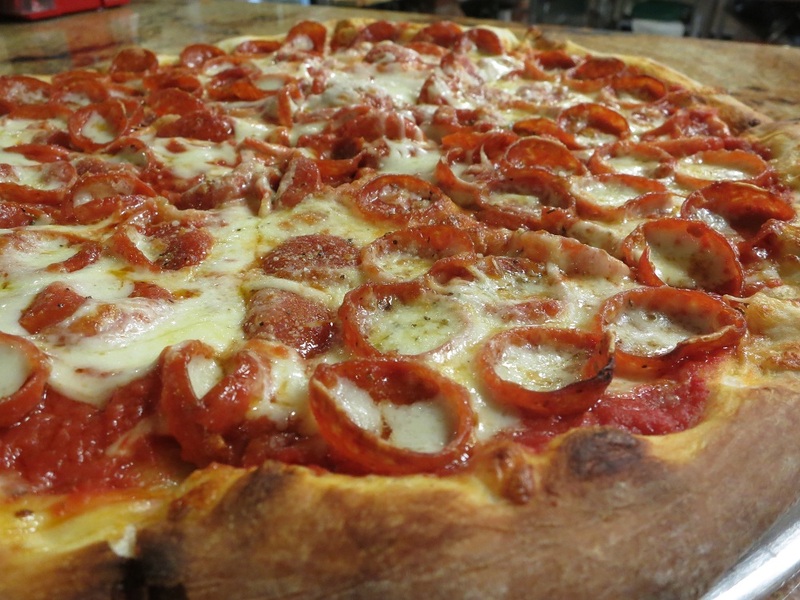 That is, it’s not just the pepperoni spices that dominate their flavor, you also can taste the flavors of the cured meat itself. Finally, the cheese is just right as well. There’s neither too much, nor too little. It holds and ties everything together without becoming a cheesy mess. Like the pepperonis, it seems of an overall higher quality that you usually find on most pizzas. The wings are also great. These are just buffalo, but if you like spicy, try the pineapple habanero. Pizza isn’t the only thing on the menu at Borgata either. The first time we went, we were told that their wings were also incredibly popular. One reason being, they’re not fried like most wings. 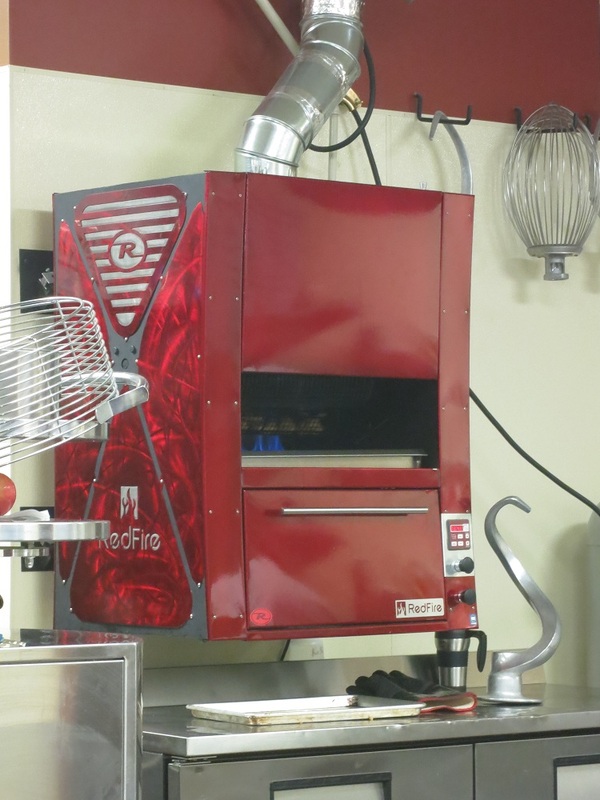 Instead, there’s this crazy looking contraption in the kitchen that bakes the wings at very high temperatures. We had to try them, and, like the pizza they were delicious. 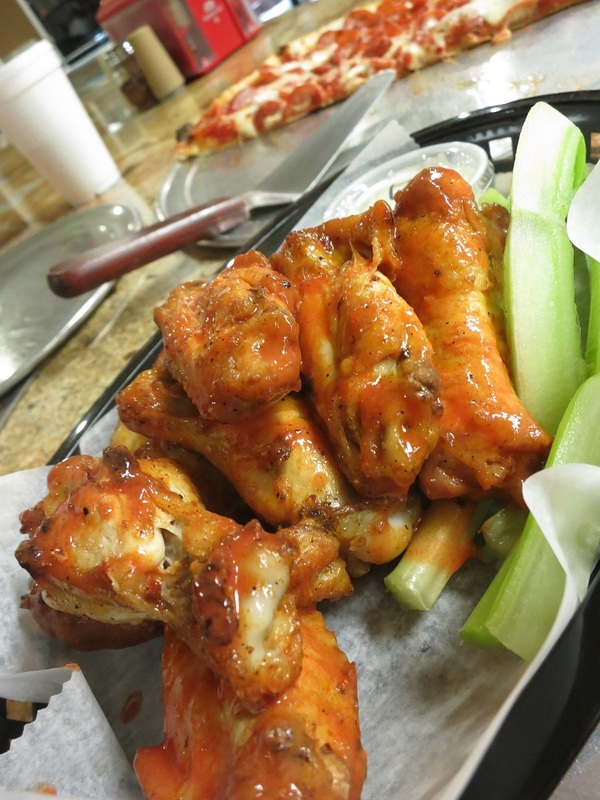 You can’t have wings without traditional buffalo sauce, and of course they do. (And it’s good.) There’s also a sweet Thai chili option. The wing-baking contraption. You can see the wings, and the fire. Also, the massive dough hook sitting on the counter–used for mixing up the crust. Finally, there are things on the menu beyond the pizza and wings I have yet to try. Namely, the pasta. Borgata has recently started offering a few assorted pastas, which, like everything else, is made in house. If the pizza is any indication, it should be delicious. My only problem will be NOT ordering pizza next time I’m in there.